Lytham & St.Annes on the Sea Lancashire - Local History - St.Annes-on-the-Sea Times Year Book and Tide Tables for 1911. YOU ARE HERE > HOME PAGE > 1610-2010 BOOKS & MEDIA > 1900-1919 Books & Media > St.Annes Year Book 1911. 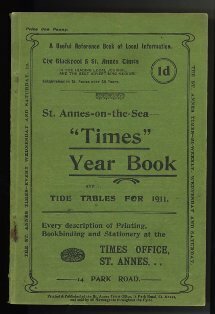 St.Annes-on-the-Sea Times Year Book and Tide Tables for 1911. Local information and a list of local event and news stories of the past year (i.e.1910).